It started with a fascination with mermaids (greek sirens that so allured Odysseus on his journeys), and now a whole order of mammals are named after this fascinations. 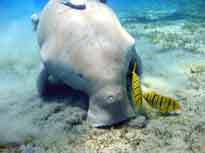 Sirenians comprise of modern manatees, dugongs and their sadly extinct relatives. This is the only herbivoruos order that has taken ot water and stays in it the whole time. The fossil record for this order is atleast 50 million year old but they are in some decline due to climate change and human interference. Sirenians have major adaptations for living water. Their forelimbs have modified into arms used for steering, the tail has modified into a paddle used for propulsion, and the hind limbs (legs) are but two small remnant bones floating deep in the muscle. They appear fat, but are fusiform(means having a spindle-like shape that is wide in the middle and tapers at both ends), hydrodynamic, and highly muscular. Their skulls are highly modified for taking breaths of air at the water's surface and teeth are greatly reduced. The skeletal bones of both the manatee and dugong are very dense which helps to neutralize the buoyancy of their blubber. The manatee appears to have an almost unlimited ability to produce new teeth as the anterior teeth wear down. They have only two teats, located under their forelimbs, similar to elephants. The elephants are thought as the closest living relative of the sirenians. Surviving sirenians grow between 2.5-4 meters long and can weigh up to 1500 kg. Hydrodamalis gigas, Steller's sea cow, could reach lengths of 8 meters but it has been extinct now for 200 years. Suffice it to say, that we helped them along the primrose path to extinction. The three manatee species (family Trichechidae) and the dugong (family Dugongidae) are endangered species. All four living species are vulnerable to extinction from habitat loss and other negative impacts related to human population growth and coastal development. Two genera and four species are of Sirenians survive. The Trichechus which includes three species of Manatee that live along the Atlantic Coasts and in rivers and coastlines of the Americas and Western Africa. 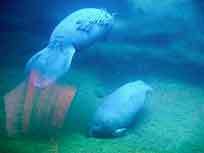 Amazonian Manatee live only in fresh water and Dugongs are found in the Indian and Pacific oceans. Of late some manatees have been venturing from their original Florida habitat up into the Carolinas and even as far up as Jersey. Just give them some time and they will be partying in Maine! 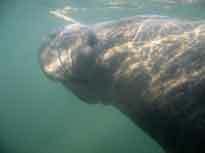 Manatees start having babies when they are about 2 years old. Pregnancy is believed to be twelve or thirteen months. Usually a single calf is born every two-and-a-half to three years. Calves can swim to the surface at birth, and they are nursed, fed with mother's milk, until around the age of one. Though they have no vocal cords, calves also vocalize at birth, which is an important part of the mother-calf bonding process. The calf remains close to its mother for up to two years. Since sirenians first evolved, they have been herbivores, likely depending on seagrasses and aquatic angiosperms (flowering plants) for food. To the present, almost all have remained tropical, marine and angiosperm consumers. They truly are like thier name implies gentle, giant and graceful cows of the sea. Articles on various creationist theories and arguments and on the value of genuine scientific inquiry. Â© Mammalsrus.com 2018.All rights reserved.